Discounts: Up to 25% off mailbox rent and 50% off fax service. ‘Free’ Rent: Tell your friends about us….if they rent, you get a free month. ‘Free’ services: Notary, shredding, limited email, magazine and newspaper recycling. Parcel Receiving: Deliveries by any courier or freight company. Availability: Your mail is sorted by 12:00 p.m., 24-hour access by request. Convenience: Easy access, lots of parking, call-in service, longer hours. Mail Management: Sorting, unlimited holding. Easy Contact: Toll-free number, e-mail, and website make it simple. Emergency Messaging: Relatives can leave emergency messages for you. 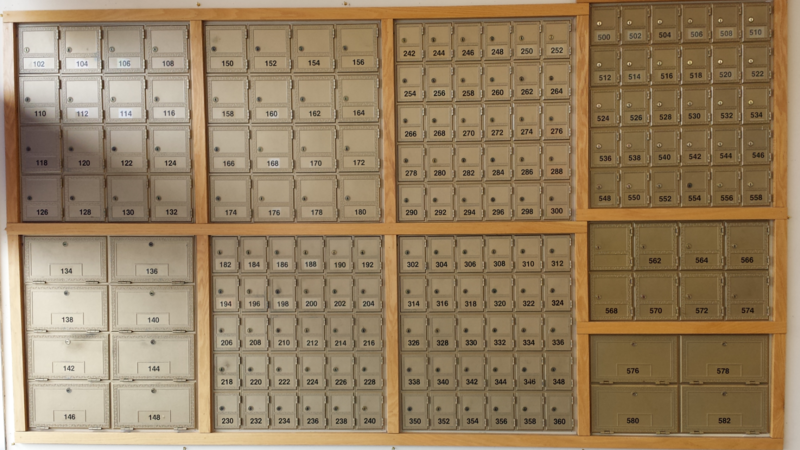 One time non-refundable set-up fee for Private Mailboxes is $25. Additional charge of $15.00 per 3 months for more than three adults (non-spouses) using the same mailbox. Non Accessible and Small boxes are for personal use only, for businesses you must use a Medium or Large box. Flexible forwarding service is available to all mailbox customers at the minimal cost of $3 per request, plus postage and materials (if any). A minimum deposit of $10 is required, from which we’ll deduct the charges, and you’ll be notified regularly about your remaining balance, or pay by credit card. Mail is sorted from your instructions so that unwanted items are held (such as catalogs) or recycled (unsolicited bulk mail). We can notify you when certain items (such as packages) are here. Your mail will be sent per your instructions weekly, on call, or by pre-arranged itinerary. We can even watch for specific pieces (such as prescription medications) and send immediately. We can use regular mail (first class or priority), to any address, including General Delivery; or FedEx 1 or 2-Day service to any street address. Begin by downloading and printing the documents below.